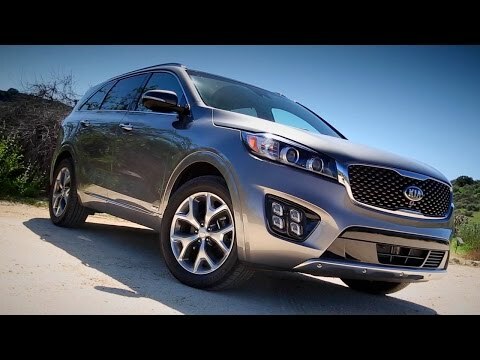 The 2016 Kia Sorento is all-new, bringing new technology, upscale style and features, and more interior space to the popular midsize crossover SUV. Among the new features are a turbocharged 4-cylinder engine, an all-around-view camera, an upgraded UVO infotainment system, improved fuel economy, and more rear-seat space. Wipers review. The headlights come on when windshield wipers are used. The Sorento is excellent for 2-4 family members. The interior is roomy enough that you don't feel cramped even though it is not the largest SUV Kia makes. The ride is good and the rear loading space is very large compared to others in its price range. It also has some storage space under the mat in rear. The back seats fold forward to allow more cargo room and the seats front seats adjust to fit individual preferences. The console is easy to navigate and you can program to open your garage door. The back seat has 3 seatbelts for easy use. The console pocket is room and has a Charger port for easy access. This vehicle rides well and its get good gas mileage. The gas tank is opened inside vehicle making it less apt to be tampered with. The rearview mirror automatically dims rear bright lights at night making it an easy transition to night driving. Over all I really love my Sorento. I have had no repairs or breakdowns. Has everything I need, room, back up camera for safety. All wheel drive. Perfect. I am currently driving my third Kia Sorento. I have owned quite a few cars and I have fell in love with the Kia Sorento. It is a great design, provides a lot of room and is such a comfortable drive. You cannot beat the safety rating and I feel safe and solid driving the Sorento. I have never had any major issues or minor for that matter with the Sorento. I keep up with oil changes and normal maintenance and that is all I have ever needed. People ask me why I drive a Kia. I tell them take a Sorento for a test drive and you will not look back. It is a great solid affordable car and it has all the bells and whistles you would find in a more expensive vehicle. The warranty you cant be, but even more so you cannot beat the safety rating. I love this car and will not be shopping for any other vehicle. I am a lifelong Kia customer. Kia Sorento all around good vehicle. My 2016 Kia Sorento has been a great car for the last 3 years. One of my favorite things is the gas mileage, I get around 27 miles to the gallon on a normal day. I enjoy all the features that come with the car. The backup camera is clear and easy to see out of, and the warning beeps when I get too close to something come in handy. I have the third row seat option in my car, which is great, but when the 3rd row is up there is only about 5 inches of space available between the seat and the rear door. This does not leave much space for anything. As far as the control of the vehicle goes, the ride is smooth and comfortable. The car has tight steering creating an ease with the control of driving. It does have a lot of power and I am able to accelerate quickly when needed.